PDS (POWER DISTRIBUTION SYSTEM) is the system that BCM controls with the operation of the pushbutton ignition switch and performs the power distribution to each power circuit. This system is used instead of the mechanical power supply changing mechanism with the operation of the conventional key cylinder. The push-button ignition switch can be operated when intelligent key is in the following condition. Intelligent key is in the detection area of the inside key antenna. Intelligent key backside is contacted to push-button ignition switch. 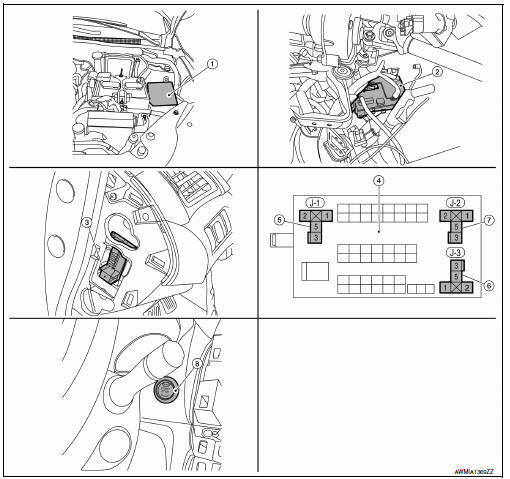 The push-button ignition switch operation is input to bcm as a signal. Bcm changes the power supply position according to the status and operates the following relays to supply power to each power circuit. The engine switch operation changes due to the conditions of brake pedal, selector lever and vehicle speed. The power supply position can be confirmed with the lighting of the indicators in the push-button ignition switch. When all the following conditions are met for 30 minutes, the battery saver system will cut off the power supply to prevent battery discharge. In order to prevent the battery from discharging, the battery saver system will cut off the power supply when all doors are closed, the selector lever is in p (park) position and the ignition switch is left in the acc or on position for 30 minutes. If any of the following conditions are met the battery saver system is released and the steering will change automatically to lock position from off position. The power supply position changing operation can be performed with the following operations. When an Intelligent Key is within the detection area of inside key antenna and when Intelligent Key backside is contacted to push-button ignition switch, it is equivalent to the operations below. Press and hold the push-button ignition switch for 2 seconds or more. Press the push-button ignition switch 3 times or more within 1.5 Seconds.